The Los Angeles Angels of Anaheim play Spring Training Baseball at Tempe Diablo Stadium in Tempe, Arizona. Tempe is just southeast of Phoenix. How do I get to Tempe Diablo Stadium? Here is a map with directions to Tempe Diablo Stadium. This stadium is NOT accessible by Valley Metro Rail. What is the schedule for the Los Angeles Angels of Anaheim Spring Training games? The Angels Spring Training schedule for the 2017 season is below. Scroll down on this page to get details on buying tickets. These games will be played at Tempe Diablo Stadium unless otherwise stated. Los Angeles Angels of Anaheim Spring Training schedule dates and times mentioned are subject to change without notice. Since the times of games may change until the schedules are finalized, check game time before you buy the tickets. This schedule is tentative until Angels Spring Training tickets go on sale. These are the Angels' Spring Training games that will be played at Tempe Diablo Stadium. To see the entire Cactus League Spring training Schedule, see the Month-at-a-Glance page. It will be updated when all team schedules are announced and final. Saturday, February 25 vs. Brewers at 5:10 p.m.
Tuesday, March 28 vs. Athletics 12:10 p.m.
How do I buy tickets to an Angels game? 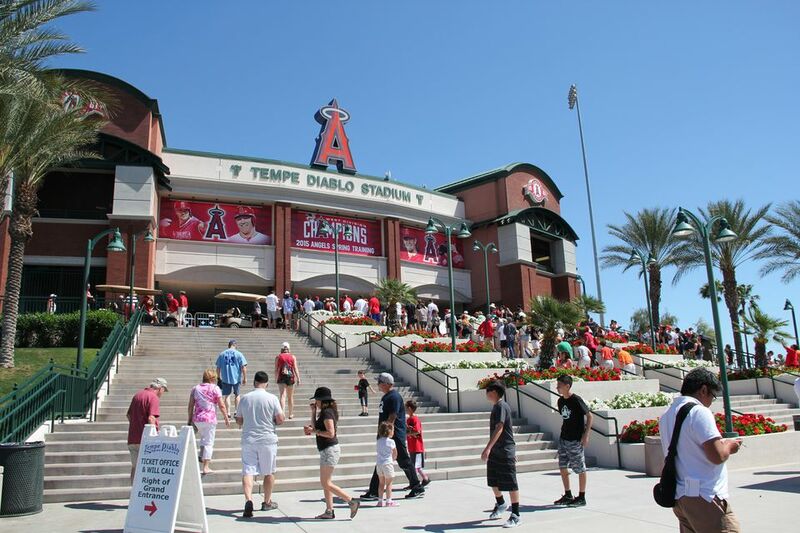 Before you buy tickets to Angels games, read these tips about Tempe Diablo Stadium. Online through Ticketmaster.com or by phone, or in person at a Ticketmaster outlet. At the Los Angeles Angels of Anaheim website. In person at Tempe Diablo Stadium Box Office. If you can't find the seats you want, try a reputable ticket broker like TicketsNow.com. Enjoy these pictures of Tempe Diablo Stadium. What is it like at Tempe Diablo Stadium? I've been to many games at this stadium over the years, so I put together some tips about Tempe Diablo Stadium for you. Parking, seats, bleachers, standing room — check these out before you buy tickets to the game.